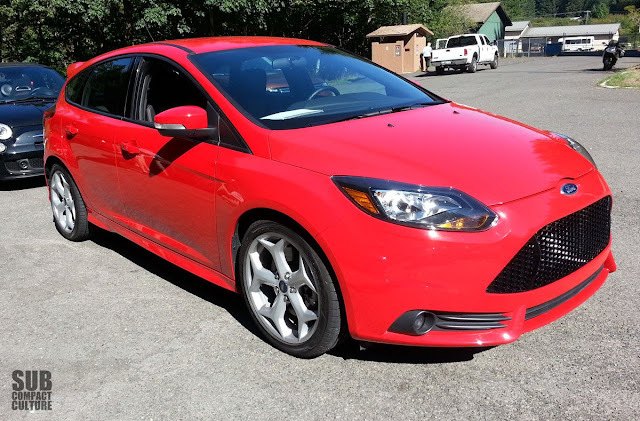 For this year's Northwest Automotive Press Association (NWAPA) Run to the Sun drive event, Ford brought its 2013 Focus ST. I'd been looking forward to having some time behind the wheel of this hot hatch for quite a while, and I'm happy to say I was not disappointed by everything I'd read about the car to date. In fact, I was more surprised with it than I expected. The ST is the "hot" version of the Focus. It's got a direct-injected 2.0-liter turbocharged EcoBoost engine making 252 hp and 270 ft/lbs or toque. Power is put down via a six-speed manual transmission, which is the only trans available—hallelujah. To aid in spirited cornering, the Focus ST employs a limited-slip differential that uses computer-controlled magic to apply the brake to the wheel that is losing traction. Power is then sent to the wheel with the grip. Other notables on this Race Red ST included Recaro seats, 18" wheels with summer-compound tires, and a great exhaust note. In fact, it was this exhaust note that first caught my attention. This thing sounds good. Under full throttle, the ST pulls hard all the way to redline, and sounds great doing so. Braking is excellent, thanks to four-wheel discs, and brake feels is equally good. And those Recaro seats are great, by the way (at least for the 30 minutes I was in the vehicle). With any front-drive car, you expect things to get a bit "pushy" in the front end during enthusiastic cornering (e.g. understear). While I'm certain you can make the front end push, the car truly does its best to guard against such FWD faxu pas. I drove the car through a set of swtichbacks and amazingly, there was extremely little understeer, thanks to a great suspension setup and a not-so-invasive traction/stability control program, especially in sport mode. The car rotated very well and did so when you wanted it, not when you didn't. I've driven a lot of front-drive cars. I would have to say that based on my short time with the Focus ST, it's probably the best handling front-drive I'd piloted. I mean, I anticipated the car to be good, but I didn't expect it to be this good. The fully loaded ST pictured above came in at about $28,000, which seems very fair. You can get into an ST for as little as $24,160, which is a great deal for a car with such wonderful driving manners. I'll tell you this: If I were in the market for a hot FWD hatchback, the Focus ST would be on my Shor lisT. We hope to spend some more time with the Focus ST in the future, so stay tuned.